It's no secret iPad owners love their devices. The American Customer Satisfaction Index and NPD both report unusually high satisfaction rates for iPad. Just in second quarter, Apple sold more than 9 million tablets, generating $6 billion in revenue. Despite the best efforts of competitors, most of which offer tablets running Android OS, nothing has yet put a dent in iPad’s dominance among consumers. The fact of the matter is that, if you own a tablet right now, it most likely is iPad. 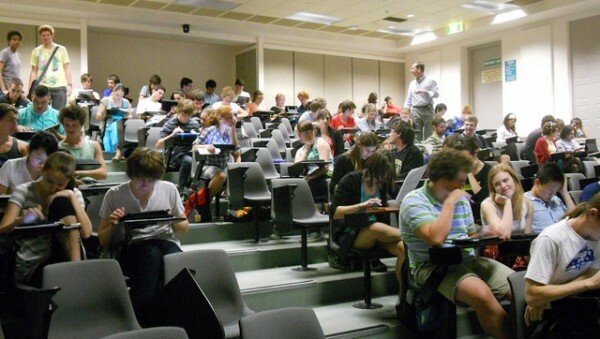 There’s another group equally smitten by iPad: higher education. I’m not talking about students, faculty or university administrators that own the tablets (I would lump these people in with the consumer category), but rather the growing number of higher-ed institutions around the country that currently issue iPads to their students. A quick Google search will reveal that there are many iPad programs in place right now at many universities. Seton Hill (not to be confused with Seton Hall) issues iPads to all incoming students. At George Fox University, students have a choice between iPad or MacBook Pro. Other institutions are more selective in their iPad deployments handing out iPads to only specific colleges or programs, such as Oklahoma State, Duke and Stanford Medical School. A few institutions have bucked the status quo and gone Android. 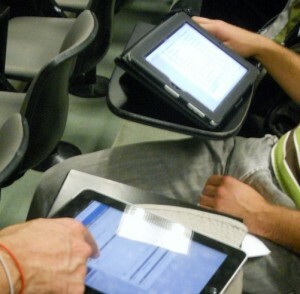 The University of Southern Mississippi deployed 1,000 Samsung Galaxy Tab 10.1s to Honors students this Fall. Seton Hall (not to be confused with Seton Hill) began seeding its Sciences, Honors and Business Leadership programs with 400 Lenovo ThinkPad Tablet PCs this Fall as well. Yet these Android tablet programs are the outliers rather than the norm. The apple of most institutions’ eye is the iPad. All of the institutions mentioned above tout similar reasons for giving their students tablet computers: mobility, innovative approaches to teaching and learning, e-textbooks, etc. What they don't clearly articulate are functionalities specific to one device that led them to choose iPad over Android, or vice versa. So with tablet program outcomes mainly the same, does it really matter what kind of tablet an institution uses? While Apple's iOS is fine for consumers, it’s a less-than-ideal choice for a university student tablet program. For one, the iPad is a locked-down device. iPad can only run what Apple says it can. The company, rather than the institution, is in control. Institutions must ultimately play by Apple’s rules, so if Apple bans an app, students can’t get it on their iPads. If a student prefers a different soft keyboard, they can’t get it on their iPad. Additionally, if a university develops a custom app to run on students’ iPads, it needs to go through the Apple App Store’s infamous approval process, which can potentially lead to delays or even rejection. And while universities can deploy custom Apps to students through the iOS developer program, the process is far easier on Android (see below). Finally, and most importantly, institutions that go with an iOS device are locked in to Apple hardware -- forever. Ready to upgrade your hardware? You can upgrade your iPad to the...iPad. There’s no future like the present for any institution that makes iPad their tablet of choice. The institution will always be subject to Apple’s hardware choices and pricing. Unless a school is already in an all-Mac environment, it’s unclear how this permanent commitment to one company's hardware and software ecosystem is a wise long-term decision. 1. Flash support. Flash runs fine on Android phones and tablets, no matter what some pundits would have the public believe. Why wouldn’t a university choose a device that runs a multimedia web standard, giving students access to the full Internet as it currently exists? Why make excuses when you don't have to? 2. Sideloading. With the click of a button in Settings, you can load apps from unknown, non-market sources with Android. This means institutions can quickly develop and deploy custom apps targeted at their students without having to go through a third-party market or cumbersome approval process. Seton Hall is already doing this by creating its own chemistry science app for its ThinkPad deployment. 3. Device choice. As previously stated, with iOS you have one hardware choice, the iPad. With Android, institutions have lots of hardware choices from different OEMs that come in many different specs and sizes. What if student feedback says 10.1 inches is too big of a screen size? Go with 7 inches. Or 8.9. This is the kind of flexibility an institution should have at their disposal for a sustainable tablet program. 4. Cost savings. Until recently, Android tablets could not compete with iPad’s $499 starting price . But Android tablet prices are now plummeting. With the introduction of the Kindle Fire, institutions will soon be able to get a slick Android tablet for the low price point of $200. (Note: If Amazon locks down the Fire by disabling sideloading and forcing everything through the Amazon App store, then it is really no better than an iPad. Luckily with Android, there are always alternatives). Higher-end tablet options like the Acer Iconica Tab or Asus Transformer (sans keyboard) run around $400. That’s still cheaper than iPad and with more functionality (as they run Flash). Meanwhile the Lenovo A1 ranges between $199 and $299. As time progresses, prices will continue to drop, giving institutions even more purchasing options. Having the ability to shop around for better quality hardware at a lower price seems like a more prudent use of student and taxpayer dollars than current university iPad programs allow. Of course there are arguments against Android, especially platform fragmentation, a less polished UI experience than the iPad’s and some perception that security is better on iOS. To fragmentation, I would say that it is less of an issue than it is often made out to be. Android’s tablet OS build, “Honeycomb", has the ability to run non-tablet optimized apps, giving users access to the vast majority of the hundreds of thousands of Android apps available. Fragmentation will also become less of an issue with the soon to be released Ice Cream Sandwich, which Google claims will unify the Android smartphone and tablet experience. To the UI, I’ll agree that iOS, in general, has a more polished user experience than Android. I’d also say this criteria is generally irrelevant within the context of higher ed -- these are college students, not grandmas, using tablets. Could anyone validly argue that Android UI is so counter-intuitive that a college student couldn't figure out how to navigate it? In regards to security, whether or not Android is indeed less secure than iOS is something many would actively debate. Rogue apps is the major concern, a problem that anti-malware apps from vendors like AVG can resolve. Companies like 3LM are bringing unified security solutions to the Android platform so this issue, like fragmentation, will likely improve in the near future. 1. Administrative decision-makers are green lighting iPad projects based on their personal preference. Just because the iPad is the most popular device in the consumer space doesn't make it the right decision for a university. 2. Apple marketing of the so-called "magical" tablet, such that higher-ed IT groups are not doing their due diligence when exploring options for tablet programs. Related: Education is one of Apple's core markets. 3. There is fierce competition among schools for the best students. Passing out the hottest gadget on the market to incoming students is as much about marketing the institution as it is about education. Universities need to make smart, sustainable choices in a time of declining state budgets and ballooning student enrollment. This perfect storm is one of the reasons why tuition continues to rise at a level that far surpasses inflation (if you want to be really depressed, check out this report on higher ed costs). Anyone that recently signed their student loan promissory note or wrote a tuition check is acutely aware that the price of higher education is out of control. While the iPad is obviously not the cause, non cost-conscious decision-making by universities plays a large part in rising tuition costs. It’s understandable why people love their iPads -- they’re great devices. Yet the commercial success of a product should have little to do with institutional decisions that involve student and taxpayer dollars. Competition and hardware commodification will continue to drive the price of Android tablets down. Android will continue to improve as a mobile OS. By choosing Android tablets, universities will have flexible, sustainable student tablet programs that get better and cost less as time goes on. Contrasted with the option of going with Apple's slick but locked down, proprietary platform, the choice seems obvious. Love affairs with products are for the consumer, not the classroom. Ryan Tyler is a free-lance writer and educator living in Portland, Or. He has worked in the entertainment industry as well as K-12 and higher education. His interests include education reform, distance education and using technology to make the world a better place. Of course, he’s also a tech geek.